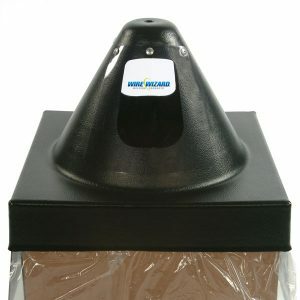 Wire Wizard® drum hoods for round drums feature a flanged design to fit on both chimed and environmental packs. 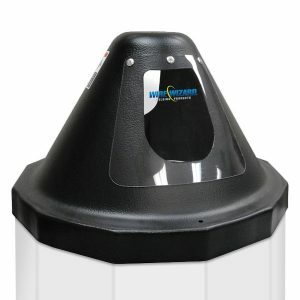 Constructed of tough polyethylene for a long shop life, all drum hoods come with a lifetime warranty against breakage. Direct pull kit with ceramic inlet ensures smooth feeding without shaving the wire. 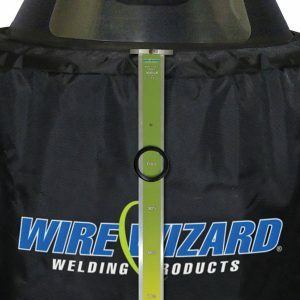 Wire Wizard® hoods for square wire packaging are constructed of tough polyethylene for a long shop life. Square hoods are available for 21″, 24″ or 29″ square boxes (533, 610 or 737mm). All drum hoods come with a lifetime warranty against breakage. Direct pull kit with ceramic inlet ensures smooth feeding without shaving the wire. 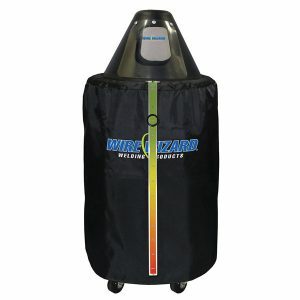 Wire Wizard® hoods for octagon wire packaging are constructed of tough polyethylene for a long shop life. 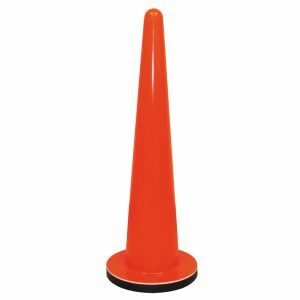 Octagon hoods are available for 20.5″ or 23.5″ boxes (521 or 597mm). All drum hoods come with a lifetime warranty against breakage. Direct pull kit with ceramic inlet ensures smooth feeding without shaving the wire. 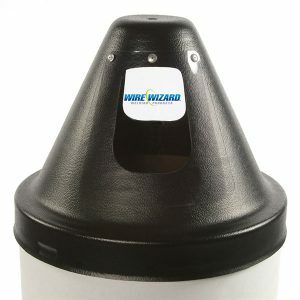 Wire Wizard® hoods for dodecagon wire packaging are constructed of tough polyethylene for a long shop life. Available for 23.5″ (597mm) dodecagon packs of aluminum wire. All drum hoods come with a lifetime warranty against breakage. A-12A connectors available for EC-4-R conduit attachment. 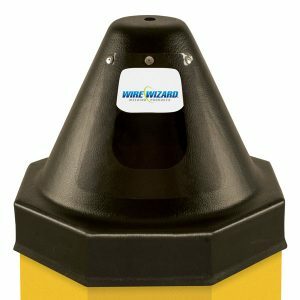 The Wire Wizard® Direct Pull Kit features an insulated quick disconnect with polished ceramic inlet to prevent wire shaving. Fits all drum hoods and wire sizes. Note: Not required if drum hood is ordered with the direct pull already included. 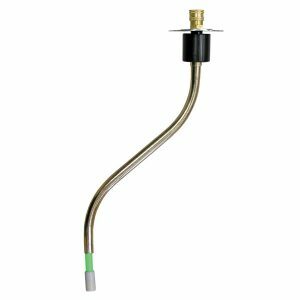 The Wire Presence Sensor and Proximity Switch Kit is a highly recommended peripheral for robotic welding applications using bulk wire. 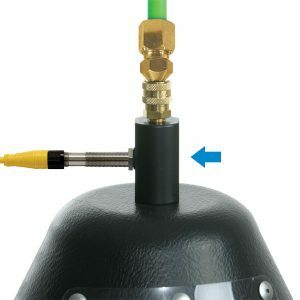 The sensor detects and signals when the drum is empty, and the proximity switch connects to a PLC to stop the welding cycle when wire is depleted. This prevents unnecessary burn backs from occurring at the contact tip when the wire is finished, saving your consumables and reducing downtime. PNP or NPN proximity switch options available. The Orbital Arm Kit is designed to provide tangle-free wire dispensing from drum packages. The arm attaches to the hood and spins as the wire is fed from the drum. 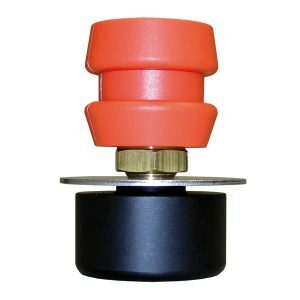 Since it greatly reduces the amount of space from the spool to the top of the drum, it eliminates wire tangling problems that can occur in this area. Features a polished ceramic inlet guide that will not shave wire. 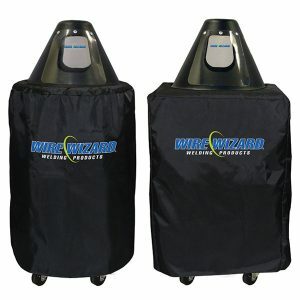 Compatible with all Wire Wizard® Drum Hoods and wire sizes up to 1/16″ (1.6mm). Wire Wizard® durable fire resistant covers provide effective protection for fiber or cardboard packaging located near the weld cell. In the US, fire resistant covers are required by OSHA for all combustible wire packaging within 35 ft (10.7m) of the arc. Available for round, square or octagon bulk wire packages. The Wire Level Gauge makes it easy to detect the amount of wire left in wire drums or boxes. The gauge features magnetic wire detection that slides down the drum as wire is depleted, offering a convenient way to monitor wire usage. Compatible with solid steel wires in fiber drum or cardboard packaging, not compatible with cored or non-ferrous wires. 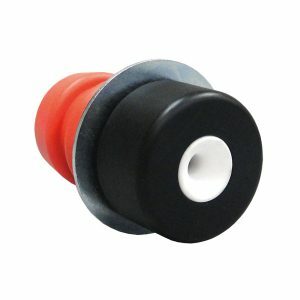 Use the Drum Connection Insulator to protect workers from the risk of electric shock from the steel quick disconnect and fittings attached to the drum. 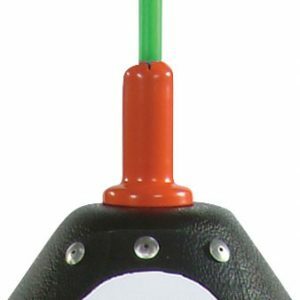 Recommended for quick disconnects without an orange insulator sleeve (standard on direct pull kits). Use the Reusable Drum Core to prevent wire flip that can often occur in coreless wire drum packages. An easy, drop-in solution to solve wire tangling problems.